Should you expect the results outlined in a proposal? Should you continue to use a consultant who doesn’t produce results in the first six months? Is it better to hire multiple specialists or one agency to cover your digital marketing needs? In this post, I want to share some perspectives on these tough questions and offer some practical steps you can take when hiring external digital marketing consultants, to ensure that your expectations and targets are met. Let’s kick off with results; what results should you expect when hiring a digital marketing consultant? What Results Should You Expect When You Hire a Digital Marketing Consultant? Should you expect the results outlined in a consultant’s proposal? Well, that depends on how the consultant has forecasted their results. Outputs can be guaranteed. Outcomes can’t. In virtually all areas of digital marketing, you are dealing with a large number of unknowns. The best search marketers on the planet will admit that they cannot guarantee where your site will rank in a year’s time, let alone one month. The same can be said for social media marketers, content marketers etc. As such, predicted outcomes are usually nothing more than calculated guesses. If you’re working with an experienced consultant, the likelihood is that it’ll be a pretty good guess, but even the best marketers are susceptible to overestimating their abilities, and not taking into account external factors. One of the best thing you can do, as a client, to mitigate against this is to separate fact from speculation, and differentiate outputs from outcomes. Ask your consultant to explain what aspects of their proposal are based on speculation, and what is/isn’t guaranteed. Replace as many unknowns (e.g. revenue estimates, traffic estimates, and conversion rates) with real numbers, and be conservative. Better to be pleasantly surprised than unpleasantly surprised. Once you’re happy with your consultant’s strategy and forecasts, expect them. In a famous experiment, Harvard professor Robert Rosenthal found that the expectations of those around us do influence our results, even when those people never share their expectations with us. How long should you work with a marketing consultant who doesn’t generate results before considering other options? The answer to this question isn’t as simple as you might expect. Digital marketing is a process that takes time to reach a desired result. Think of it like running a bath – you can’t turn the tap on and have a full bath in a matter of seconds. “No matter how great the talent or efforts, some things just take time. You can’t produce a baby in one month by getting nine women pregnant.” – Warren Buffett. Of course, the work in the first twelve months contributed to the 600% growth spurt, but imagine if I had fired the digital marketer (in this instance, myself) after the six month milestone on the basis that we had only achieved a tiny amount of growth during this period? Had that been the case, I think it’s unlikely we would have grown by 600% in months 12-16. The flip side of the coin is that you probably pay your consultant on a linear monthly retainer. It’s understandable that many clients get itchy feet when they find that there has been very little growth after months of paying for consultancy. Ultimately, it depends on a number of variables, such as the age of the business, the amount of time spent by the consultant, and the type of digital marketing campaign in question. For example, it typically takes longer to generate results from an SEO or content marketing campaign, than a paid search or social advertising campaign. That said, virtually all aspects of digital marketing grow gradually, and then suddenly. 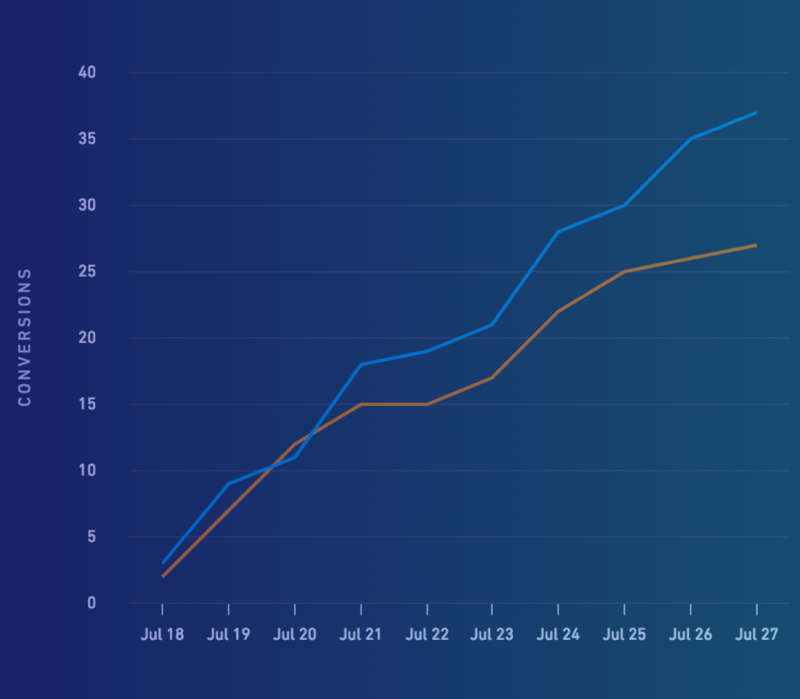 If you’re not seeing a gradual improvement in your campaign over the first six months, it might be time to investigate the reason why. In defence of the great digital marketers who sometimes don’t achieve desired results, a lack of tangible results can be due to the client’s business model, or unwillingness / inability to implement recommendations quickly. Generally speaking, though, the issue is most likely to reside in the consultant’s strategy, especially if the business has achieved good results in the past. If this is the case, be patient, but be ready to move on if you suspect your consultant isn’t being effective or generating the results they anticipated. In this final section, I want to cover four tips you can use to increase the odds of a positive ROI from outsourcing your digital marketing to a consultant or agency. 1. Pay your consultant for value, not time. When you pay a marketing agency an hourly rate, you create a conflict of interests. The agency benefits by giving your campaign to a junior member of staff (lower cost to the agency), when you want your campaign to be managed by their most able and experienced staff (this is common in larger / fast growing agencies). Most importantly, though, the agency isn’t incentivised to go above and beyond to help you grow your businesses via any means possible. Time-based projects place a disproportionate amount of risk on the client. At the same time, performance-based contracts rarely work over the long run due to the pressure / incentive for the agency to produce short-term results at the expense of longevity. A good balance is to work with a consultant who works on a value-based pricing model. Think of this in the same way as how you pay a locksmith. When you’re locked out of your house, you place a certain value of getting back into your house, and so you might pay a locksmith £200 to change your locks and let you back in. You’re not paying for his time or performance, you’re paying for the value you place on his services. When arranged properly, value-based pricing allows an even spread of risk between the client and the consultant. Let’s say your business turns over £2 million per year, and a consultant believes they can help you reach £3 million per year within 12 months. The value of the consultant’s services generate an extra £1 million per year for your business, so we might agree that she is compensated £250,000 (25%) for the first year, paid in weighted monthly instalments, providing they hit the proposed target. 20% of any increase in revenue attributed to the consultant’s work. This way, if by then end of the project the business has only grown to £2.5 million (£500,000 off target), the consultant would only be paid £100,000 (20% of the £500,000 increase), which is still very profitable for the client and the consultant. If the business hadn’t grown at all, the business would only have to pay £35,000 to the consultant, a relatively small cost that’s much lower than what you’d likely pay a day-rate agency over a 12-month period. From our experience of moving from time-based consultancy to value-based consultancy at Venture Harbour, projects structured in this way are most effective as they spread risk evenly and put the client and consultant onto the same side of the table. Four years ago, I was at a conference in London when a friend told me about an SEO consultant he’d hired for £300/month who had got his website to #1 for a keyword that generated £10,000 per month in profits for his business. While congratulations were in order, a quick look over the consultant’s work made it clear that he’d unknowingly hired a black-hat link builder who was building thousands of dodgy links. I warned him against using this consultant, but his response was more or less “the proof is in the pudding”. Shortly after the penguin update, my friend lost all of his rankings and spent the good part of eighteen months filing disavow requests and building his business from scratch. Here’s the thing, bad advice will cost you a lot more over the long run than good advice. Pay for the best advice you can afford, and your consultant will make you significantly more than they charge in increase revenue and profit. Due to the rising popularity (and budgets) surrounding digital marketing, many PR, web design, and traditional marketing agencies have began offering digital marketing services in an attempt to cash in on the trend. Considering that a PR agency offering bolt-on social media services will probably cost the same as hiring a specialised and experienced social media firm, you’re probably better off hiring a company or consultant who specialise in the area that you’re looking for. When you’re hiring a digital marketing consultant, you need to ask good questions to understand their level of motivation, ability and commitment to growing your business. Any consultant can show you examples of previous work, or examples where they implemented an effective digital marketing strategy, so asking for these won’t help you sift the wheat from the chaff. Can you show me several examples of URLs you’ve ranked well in Google in the past twelve months, and what impact it had on the site? If after six months we hadn’t achieved our desired target, and you had one month left to increase our revenue by X, what would you do? If we did everything outlined in your proposal, what would our top two competitors need to do to beat us? If you were in our position, and you had to choose a digital marketing consultant, but couldn’t choose yourself, who would you choose and why? I hope this post has armed you with some good ideas, questions, and actions you can implement to make hiring a great digital marketing consultant a little bit easier. If you’re looking for digital marketing consultancy services, feel free to get in touch. If our services aren’t the right fit, I should be able to put you in touch with someone who I can personally vouch for. A really good read. Loved a few points, especially the option of how to make a hire and make sure they’re focused on providing results with an incentive. And I really liked the questions – I always think it’s good to put a person in a realistic situation and see how they react. Especially with the competitor question and the one of asking what they would do in the situation where they don’t bring in the required results. I’d like to a bit of mine. The expectations bit. That’s a really important bit. You mentioned that in some cases the results are less than expected due to a flawed business model or another reason that has nothing to do with the consultant’s work. I would say there’s more to it – I really like when a consultant is brutally honest with me. If we have a flaw, I’d like to hear it. In my opinion a good consultant will provide me with a realistic view of what position my business is in. Especially if there’s an issue which may affect the overall result. I know it’s a bit hard as people don’t want to hear problems, they’d like to hear solutions, but it’s really good insight as well. It’s a great way to build trust, too. Very interesting post, I can see more and more companies using consultants to work with the agencies in years to come, as consultants understand the industry and will help business achieve their goals. Now a days I find agencies are very sales driven and not so much performance driven, there’s a long of money to be made for agencies and like you said the rate is hourly. Using consultants over agencies or hiring consultants to work with the agencies, will only help business, especially the ones with limited knowledge of digital marketing and don’t see the need to employ a digital marketing specialist full time. This is a service I’m looking to do myself, it was an interesting read, thanks.